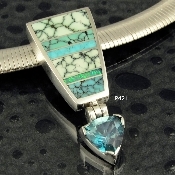 Hileman Silver Jewelry offers turquoise pendants in sterling silver inlaid with turquoise colors ranging from light blue to green with a variety of spider web patterns. Some of the turquoise pendants you see might have recently sold. If the pendant has sold it will take 3 to 6 weeks for us to make a new matching one for you. If the turquoise pendant you purchase is out of stock, we will notify you immediately and you will have the choice to cancel your order or wait for us to make a new one. 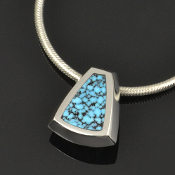 Most of the turquoise pendants you see are also available in Continuum sterling silver, 14 karat white or yellow gold or stainless steel for an additional charge. 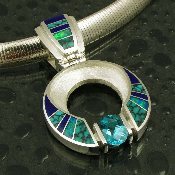 Handcrafted turquoise and opal pendant with pave` set white sapphire accents. 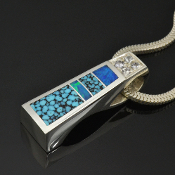 This sculptural pendant designs showcases the spiderweb turquoise and Australian opal inlay quite well. 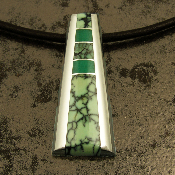 Sterling silver pendant design inlaid with spiderweb turquoise, chalcosiderite and chrysoprase. The top and bottom pieces are chalcosiderite. The solid green pieces are chrysoprase and the center piece is spiderweb turquoise. Amazing sterling silver pendant inlaid with spiderweb turquoise, deep blue lapis and genuine Australian opal by Mark Hileman. 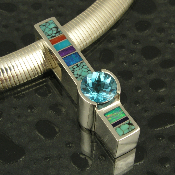 A channel set 2 carat blue topaz accents the inlaid stones. Sterling silver pendant inlaid with spiderweb turquoise, variquoise, Australian opal, and turquoise. Trillion cut blue topaz weighing 2.5cts. dangles from hinged connnection. Handmade sterling silver pendant inlaid with Australian opal, sugilite, coral, turquoise and spiderweb turquoise accented by a 2 carat round blue topaz. 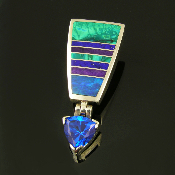 Unique blue topaz sterling silver pendant inlaid with Australian opal, lapis, sugilite and chrysocolla. A beautiful trillion cut blue topaz weighing 2.5 carats dangles from a hinged connection below the body of the pendant.